Accompanied by your guide enjoy a full day of sightseeing in New Delhi with its wide tree-lined avenues and Royal Mall designed by the English architect Edwin Lutyens. Built between 1921 and 1929 the buildings are grandiose and classical symbolic of power to administer and rule. New Delhi was chosen to be the Capital of India by the British in 1911. Starting at Rashtrapati Bhavan, the official residence of the President of India, continue east down the mall to India Gate Located at Rajpath. This imposing memorial is 42 metres high and is a popular relaxation area. Following India's independence, India Gate became the site of Indian Army's Tomb of the Unknown Soldier, known as the Amar Jawan Jyoti. The Qutab Minar notable for being one of the earliest and most prominent examples of Indo-Islamic architecture. The Qutab Minar is one of the many masterpieces that depict the sheer brilliance of the ancient Mughal architects. Raj Ghat the last resting place of Mahatma Gandhi, the Father of the Nation. The cremation of Mahatma Gandhi took place at the Delhi Raj Ghat, on 31st January 1950. Visiting the Memorial is a somber moving experience. 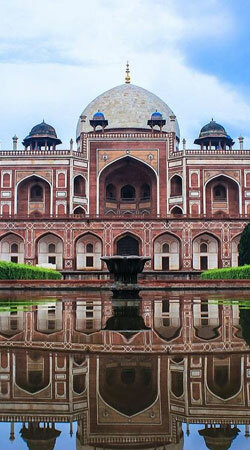 Humayun's Tomb is one of the best preserved tombs in Delhi city it has beautiful high arched entrances, which spread light into the interior. The grounds are landscaped with beautiful gardens. During the afternoon spend time at the National Museum. This is India’s finest museum that houses excellent variety of historic artifacts. You need time to get around and fully appreciate some of the rare ancient exhibits on display here. This tour is for those interested in history and the interesting connections that are the result of India’s interactions with the rest of the world right though the ages. Jantar Mantar is also called Delhi Observatory and it was built by Maharaja Sawai Jai Singh II of Jaipur in 1710 A.D. It is a remarkable structure consisting of fourteen geometric devices used for measuring time, forecasting weather changes, and predicting behavior of planets. Today it still fascinates to know how predictions are made and how accurately time can be measured by non mechanical means. Enjoy the beguiling charm of the Capital city. 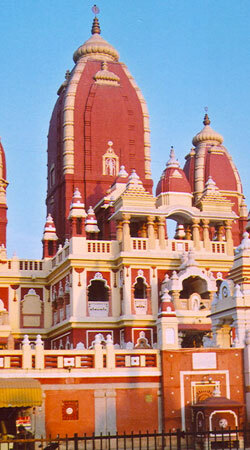 The Birla Temple was built in honour of the Hindu goddess of wealth, Laxmi, and of her consort, Lord Vishnu. The temple has many shrines, fountains, and a large garden. The Lotus Temple is situated at Kalkaji close to New Delhi and it has been constructed to resemble a lotus flower. The huge lotus flower has been made out of marble, dolomite, cement, and sand. It has become an iconic building in New Delhi because of its unique architecture. This Bahai temple does not impose restrictions on any visitor and is open to people of all religions.